Collingwood Magpies coach Rob Wright worries what Kim Ravaillion tries to get away with when his back’s turned. Not because she is a slacker. Quite the opposite. Protecting the Diamonds centre from her uncompromising work ethic is one of the coaching challenges around a player who has not had a break from netball in six years. Ravaillion was 19 and yet to play her first national league game when she made her Diamonds debut in chilly England in 2013. 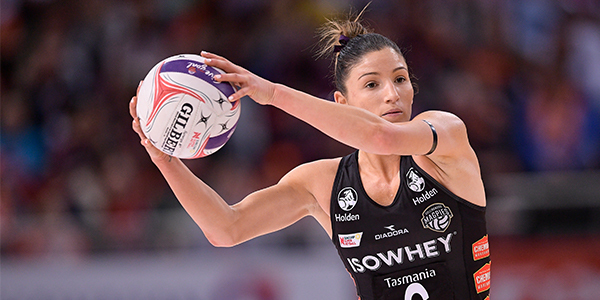 Every January since then the midcourter has left behind either her Queensland Firebirds or Magpies clubmates to complete an international mission. At times she played and trained through pain, like she did at the end of 2015 when a foot problem affected her preparation for games. Having been rested from the recent Quad Series in England, Ravaillion has returned to Magpies training with more zip. “She needed a freshen up,” Wright said. A two-time premiership winner for the Firebirds, Ravaillion is set to become one of the youngest players to notch 100 career games this season. If all goes well, the centre will achieve that milestone in Round 8 at the Sunshine Coast, somewhat astonishingly before her 26th birthday. With age on her side it’s conceivable “Rav” could play at this level for almost another decade and push that tally to a rare double century. “She’s one of those (hard workers),” the coach said. “Laura Langman was the same. They’re two athletes you don’t have to worry about them doing too little, you have to worry about them doing too much. Collingwood has practice matches booked against the Sunshine Coast Lightning at Glenorchy, Tasmania, on February 1 and the Firebirds in Bendigo on February 23. Both will be vital to plan how the side squeezes Ravaillion, Ash Brazill and sisters Madi Robinson and Kelsey Browne into the three midcourt positions.